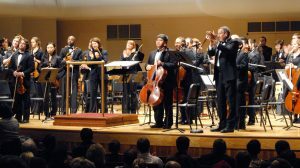 Huxford Symphony Orchestra is joined with Tuscaloosa Symphony Orchestra for an annual combined concert. 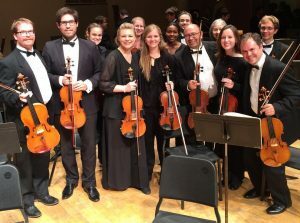 A key component of the ensembles program at the University of Alabama School of Music, the Huxford Symphony Orchestra is open to music majors as well as students from other disciplines around the university. The Huxford Symphony rehearses from 2-3:45pm on Monday and Wednesday and members receive college credit for playing in the ensemble. During the 2018-2019 season, the orchestra will perform Debussy’s La Mer, Shostakovich’s Symphony no. 10, Stravinsky’s Rite of Spring, and Bernstein’s Symphony no. 2 “The Age of Anxiety”, among other works. The Huxford Symphony will perform with internationally renowned pianist Alexander Toradze, will collaborate with the Tuscaloosa Symphony Orchestra in a side-by-side performance, and will feature faculty soloists and the winners of our student concerto competition on concerts throughout the season. For more information and for concert tickets, visit music.ua.edu. We hope you will join us for the 2018-2019 Huxford Symphony season! Purchase tickets here. Check back in June 2018 for more information!